MK Properties / Uncategorized / Where are the Best Real Estate Investments in the GTA? Where are the Best Real Estate Investments in the GTA? Hint, they are not in the GTA! If you have been following my blog for a while, you know we aim to mitigate risk and never invest based on market speculation. We only invest in properties that will have a positive cash flow after ALL expenses are paid off each month (enough to mitigate risk of increased interest rates as well as to pay for unexpected repairs down the road) and also have our tenants pay off our mortgages. We look to at least beat average stock market returns and have the asset provide between +6% to + 8% annual returns without taking appreciation into account. In addition, we invest in markets that have a very low vacancy rate (which is virtually all of southern Ontario, given our immigration rate and need for affordable housing) and are poised for future economic growth. Check out our previous blog “Could Ontario’s Golden Horseshoe be the best place to invest…on Earth?” as we go through the economic indicators as to why our little pocket in Ontario is growing, and may continue to grow for many years to come (Just google Ontario Immigration as well as GO train expansion and you will likely see a roadmap of future investment potential). Once upon a time, Toronto and it’s surrounding area (the GTA, or Greater Toronto Area) was a great place to invest in real estate, and still mitigate risk. Over time, as the housing market grew much faster than the rental market, we knew those times would eventually come to an end, and it is unfortunately far behind us now. There are still investors that purchase properties in the GTA, however virtually all of those are speculative investments and rely on market appreciation to profit. They also carry a very large risk should the market correct or something unexpected happens. As an investor, I would love to invest in my own backyard, but I have to ensure positive cash flow to mitigate risks in the housing market and be able to profit each month. But I also need to be flexible in the fact that Real Estate is very much local. We should invest in places that will be secure financially each month, but are also poised for future economic growth. Detached homes in the GTA are now over a million dollars. 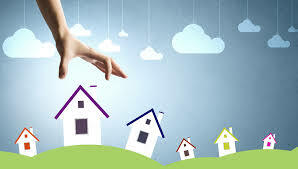 This forces new homeowners as well as new immigrants to move outside of the GTA should they want to purchase a home. 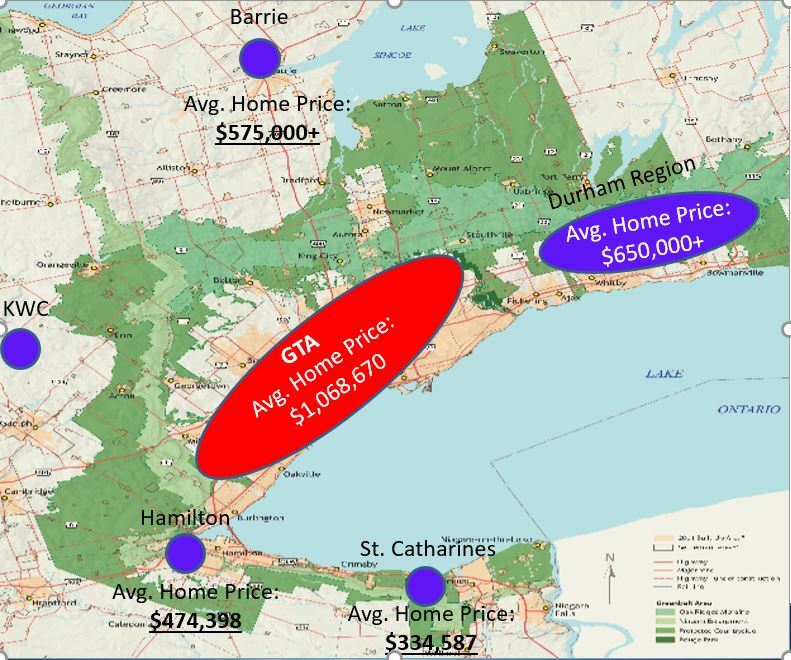 If we go a little bit deeper and look to markets just outside of the GTA, we will see tremendous price differences. Take a look at the map Below and you will see. For Example, Burlington is part of the GTA and has a very high price for detached homes, but if you drive just 10 minutes further west, Hamilton has average home prices that are less than half (ie: Hamilton Mountain, which is the suburbs of the city is at around $470K). In a future post we will talk about our strategy which is to add a legal secondary suite to homes that we purchase, but just seeing a price gap like this, It’s probably a market worth looking into. 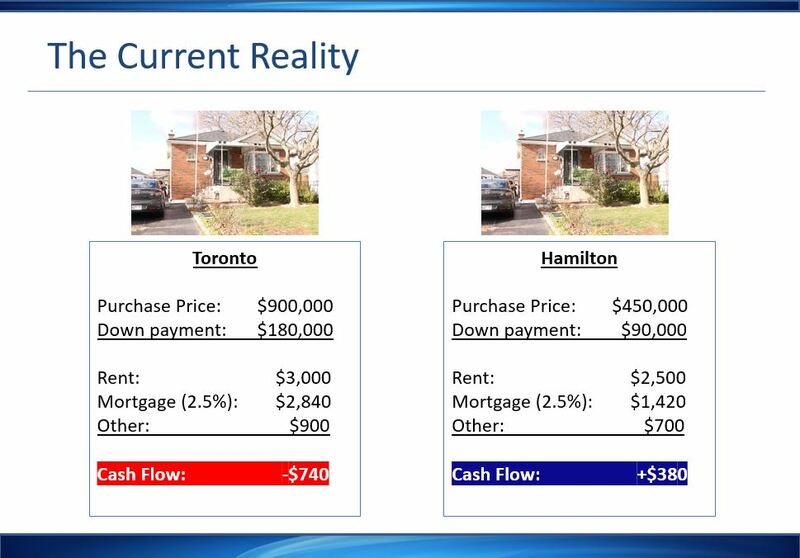 The image below shows what we face with investing in the GTA vs say Hamilton. Home Prices are substantially lower, however average rents are not much lower given the need for housing. It is quite clear where the more stable investments are The above example is similar to other municipalities like Durham Region, Barrie, Kitchener/Cambridge, And the Niagara region. I am not someone who bets on appreciation growth, but with such a gap in home prices between the GTA and some of these other municipalities just a short distance away, I would not be surprized to see these cities grow for many years to come. Numbers are one thing, but economics for future growth are another. If you google the official plan of any urban centre outside of the GTA it is likely built around infrastructure to allow for more affordable housing, and also adding transportation. This is significant spending that is in preparation for the influx of population growth that Ontario has, and will have for the foreseeable future (Canada has double the Population growth than the USA per capita, and about a quarter of our new immigrants are coming to Ontario, that’s about 100,000 people a year, with no signs of slowing down…but actually growing! ).